GALION — Different medalist, same result. 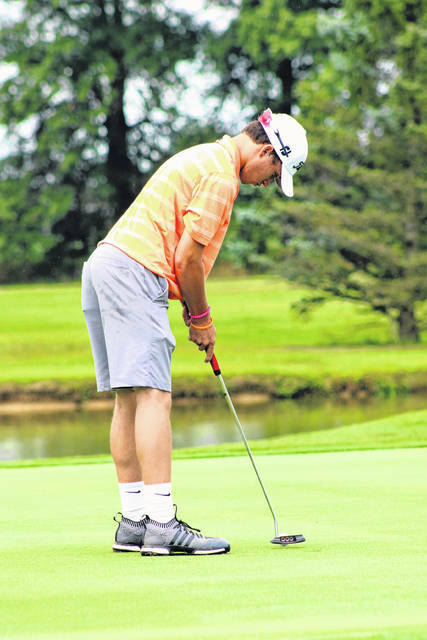 With Spencer Keller leading the way, Galion successfully defended last year’s team title at Sycamore Creek Golf Club. Keller finished his 18-holes at 6-over-par 77 Monday in went, sloppy, misty conditions at the former Galion Country Club. Jack McElligott and Matthew McMullen each shot 82 for Galion. Rounding out the scoring for the orange shirt-clad Galion squad was freshman Max Longwell, shooting an 86. Kaleb Harsh finished with a 94 and Bronson Dalenberg turned in a card of 95. Galion would cruise to the team title for the second year in a row, firing a team score of 327 to defeat the runner-up from Madison by 30 strokes (357). Rounding out the field at the invite were: Cardington- 361; Clear Fork- 362; Upper Sandusky- 375; Highland- 379; Centerburg- 411; Bucyrus- 432 and Mansfield Senior- 452. The Tigers were at Deer Ridge Golf Course for the Clear Fork invite on Thursday morning and will be back in action again on Monday, Aug. 13 when they head to The Golf Club of Bucyrus for the Elk’s Invitational at 9 a.m.
Seemingly trying to cram in as much competition as possible before school starts, Galion’s busy schedule continues next week. On Tuesday, Aug. 14, Galion will head south to the NorthStar Golf Club in Sunbury, home of the Ohio High School Athletic Association State Golf Tournament, to compete in the Warrior-Jaguar Classic. Tee time on Tuesday is 9 a.m.
MARION — The Galion Tigers golf squad opened up its Mid-Ohio Athletic Conference schedule on Tuesday, Aug. 7 with a trip to Marion Country Club for a clash with the hosting Harding Presidents. Galion would have no issues with their conference foe, leaving Marion with the 173-195 victory to begin the dual-season at 1-0. Spencer Keller was the leading Tigers golfer on the day, shooting a nine-hole score of 39. Matthew McMullen turned in a 44 while Jack McElligott and Max Longwell both shot a 45 to round out the kept scores for the squad. Kaleb Harsh finished at a 49 and Bronson Dalenberg wrapped the Galion scoring with a 50. The Tigers were undefeated in the MOAC a year ago enroute to capturing the conference team championship. Spencer Keller prepares to putt on the ninth hole at Sycamore Creek during the Galion Invitational on Wednesday morning. Keller would be the invite medalist, finishing with an 18-hole score of 77 to lead the Tigers to the title. 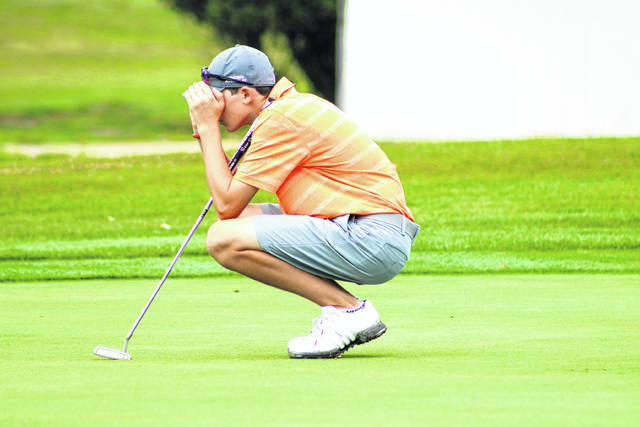 Galion’s Matthew McMullen eyes the pattern of the green to determine the path that he must take for his putt. McMullen wrapped the day with a score of 82 as the Tigers claimed the Galion Invitational crown once again. 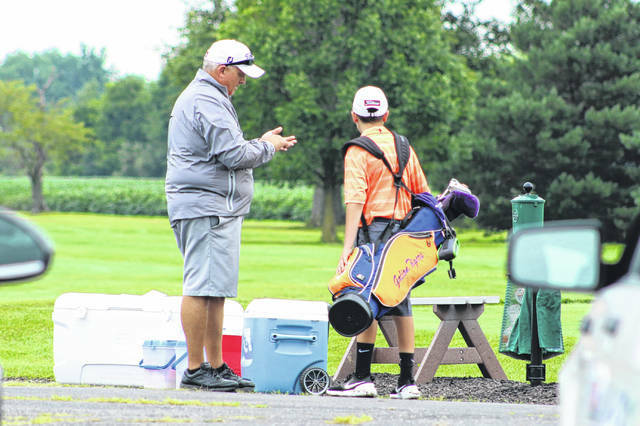 Head coach Bryce Lehman shares a coaching moment with freshman Max Longwell before Longwell tees-off on the 10th hole at Sycamore Creek during the Galion Invitational on Wednesday. Lehman, Longwell and the rest of the Tigers won their hosting invite, defeating runner-up Madison by 30 strokes.